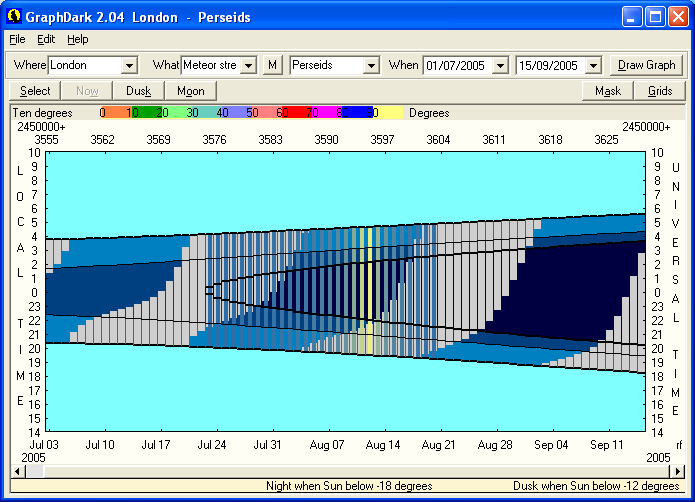 The period of visibility of a meteor stream can be displayed on the timetable, showing when the radiant is above the horizon and when moonlight will interfere. The lines are just a little brighter than the sky background at the stream limits and increasing to the full object colour around maximum, August 12th in this example. For periods outside the specified stream limits nothing is shown. In this example the coloured altitude mask has been turned off so the night of maximum shows as a yellow bar. Clicking on the timetable will show the meteor radiant on a sky diagram or give details of the expected hourly rate in the coordinate view.